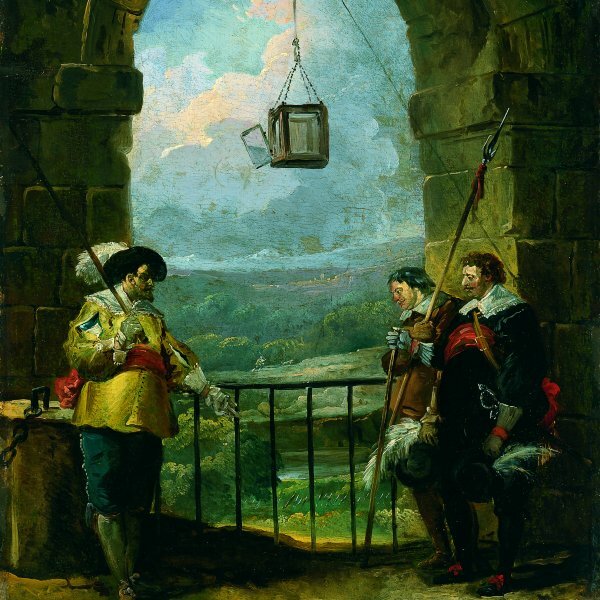 Son of an official in the service of the Marquis of Stainville, Hubert Robert trained at the prestigious Collège de Navarre in Paris. He probably received his first lessons in drawing from the sculptor René-Michel Stodtz, although it has also been suggested that he studied with the painter Pierre-Jacques Cazes. In 1754 Robert travelled to Italy accompanied by his patron, the Count of Stainville, who had been appointed French ambassador. Although not a student of the Académie Royale de Peinture et Sculpture in Paris, he was accepted in Rome as a student at the Academie de France. There he met Giovanni Paolo Panini, a painter who specialised in topographical views of Rome and whose work made a profound impression on the young Robert. 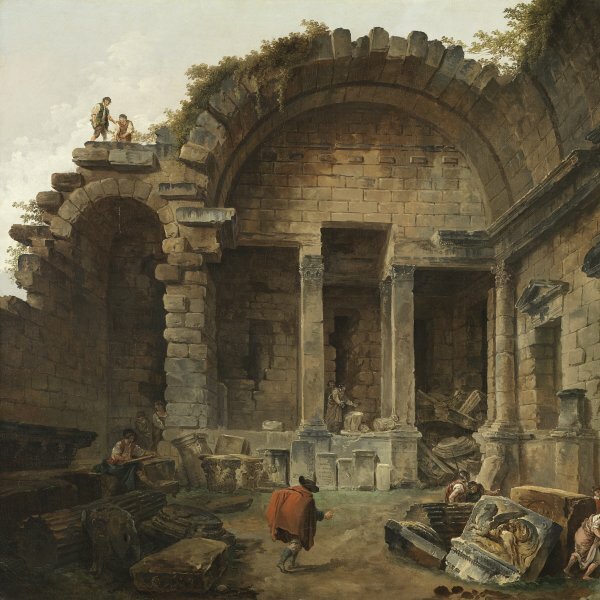 It was at this period that he began to paint the views of classical ruins, both real and imaginary, for which he is best known and which earned him the nickname of “Robert des Ruines”. In 1765 Robert returned to Paris where his distinctive and personal views of Rome, inspired by Panini and Piranesi, immediately enjoyed enormous success. Two years later he was admitted to the Académie Royale, presenting The Port of Ripetta, Rome as his entrance piece (École Nationale Supérieure des Beaux-Arts). From that point onwards he exhibited regularly at the Salon, where he was extremely well received by critics. Throughout his career he not only painted landscapes of Italian motifs but also focused on French views, in particular of Paris and the Île-de-France. In 1778 Robert was appointed designer of royal gardens. He also undertook various decorative projects for aristocratic residences and palaces, such as the one for the château Méréville (Art Institute of Chicago) and for the château de Fontainebleau (Musée du Louvre). In 1784 he was appointed Garde des Tableaux of the Musée Royale. Robert was imprisoned during the Revolution from 1793 to 1794 but the following year was made curator of the Louvre. His famous views of the principal gallery of that museum date from the last decade of his life.